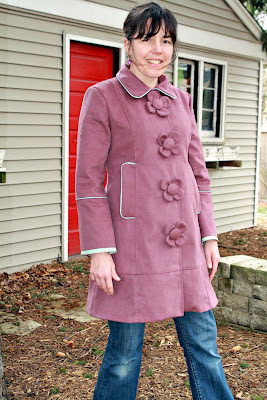 UPDATE: You can vote for my Flower Button Coat in the VintageModern Design Challenge through Thursday, March 22. You can only vote once and you must register at the BurdaStyle website in order to do so. You can find my entry here. I'm project #11. Thanks!!!! For the moment, I feel like a powerhouse when it comes to completing projects. This probably won't last long, so I'm going to enjoy it while I can! I learned a lot from this project and I'm already planning what I'm going to do differently the next time I make it, but I'm happy with how it turned out. Now keep your fingers crossed that I win the challenge! I'll keep you posted on how I do. And then I finally finished Melissa's bias trim denim skirt. I had to re-do the waistband because I just didn't think the straight waistband was working. A rectangular/straight waistband is theoretically supposed to work when the skirt sits at the high waist, but I haven't found this to be the case. Or I should say, it works for my 4-year-old but not for anyone with a womanly shape. So, ta-da, here it is! I love the button Melissa's picked out from my collection. It gives a masculine touch to an otherwise very pretty skirt. That's it for last week (she says while flexing her sewing muscles). This week will be a bit less exciting. I need to finish a few odds and ends and I offered to help a local Irish Dance school finish off six skirts for their St Patrick's Day show. I bartered with them so now Cora will get to take some Irish dance lessons! 2 comments on "What's Up: New Dress for Jen, Finished Skirt, VintageModern Coat"
Fantastic job on the coat! I also like the way you added a tie on the dress and the fun button on the skirt. Thanks, Emily! Keep your fingers crossed for me in the BurdaStyle/VintageModern challenge!